Rohde & Schwarz developed R&S®VENICE Control in close cooperation with leading studio operators to meet the high demands of multicamera recordings. 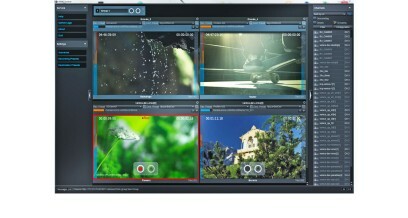 R&S®VENICE Control makes it possible to record up to 16 independent SD, HD or UHD-1 channels in all professional production and broadcast formats. The software unites single and multichannel recordings in a flexible client-server ingest solution. The user simultaneously controls up to 16 independent R&S®VENICE channels via the straightforward user interface. All R&S®VENICE channels in the network are automatically detected via multicast. Configuration via static IP addresses is also possible. All detected or configured R&S®VENICE channels can be added to the ingest application via drag and drop. Using the group functionality, channels can be combined into groups. These groups can be easily expanded with further channels during operation, for example to add freed-up channels directly to an ongoing recording. All settings required for recording are available as presets. The user simply assigns these to individual channels or groups. Presets are copied from one channel to another or to a channel group via drag and drop. An unlimited number of presets can be created and swapped with other users. Thanks to the integrated lock, presets are protected against unintentional changes. This ensures that all recordings are performed with identical parameters. All settings, including the channels and presets used for a recording, can be saved as scenarios, which simplifies recurring recordings. R&S®VENICE Control administers any number of scenarios. Recordings are started as a crash record with all settings saved in the presets, simply by pressing the record button. R&S®VENICE Control offers automatic file and directory naming plus a hierarchical structure on the file system using wildcards. For this purpose, the user merely creates parameters, such as date, channel name, channel number or recording name, which are then automatically filled with the respective values. This eliminates the time-consuming process of manually creating a structure. The dual-destination functionality makes it possible to save all recordings simultaneously to two separate storage locations. This eliminates time-consuming copy processes. Users see the selected storage locations and the current storage utilization at a glance. With a single click on the particular file path, they directly access the data that is being recorded. Thanks to the integrated R&S®Spycer data management tool, individual file operations can be executed directly from R&S®VENICE Control without having to switch between individual applications. Edit-while functionality enables editors to access data that is being recorded, immediately after recording has begun. In combination with the Avid workflow option, the data can be written directly to a connected Avid ISIS system and registered in Avid Interplay. R&S®VENICE Control allows all codecs offered by R&S®VENICE 2U and R&S®VENICE 4K to be used. This makes further transcoding unnecessary. R&S®VENICE Control functions according to the serviceoriented architecture (SOA) principle and communicates with the R&S®VENICE 2U and R&S®VENICE 4K systems via the framework for interoperable media services (FIMS) standard. R&S®VENICE Control can be installed on as many client systems as desired and allows redundant control of all ingest tasks. In the event of a failure, all ingest control processes are continued by another R&S®VENICE Control instance without interruption.